In GetApp’s Q3 2016 rankings for accounting software, Quickbooks Online jumped from fourth to first to narrowly edge out close rivals Xero and NetSuite. Freshbooks and Zoho Books made up the top five in the latest Category Leader rankings. The ranking is put together by using five different factors that are crucial for a small business when choosing software. These are: security credentials, mobile app availability and rating in the Apple App Store and Google Play, number of fans and followers on social media (Facebook and Twitter), user reviews, and number of integrations. Each of these factors is equally weighted, with a maximum of 20 points awarded for each one, adding up to a total of 100 available points. “The Category Leader rankings for accounting were hotly contested this year, with only three points separating the top three. Quickbooks Online mobile apps and integrations helped it secure top spot, while Xero also scored well in integrations and user reviews, with a maximum of 20 points for each. 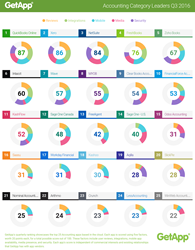 Netsuite cemented its place in third with a perfect 20 in security - the highest score for this data point - and another perfect 20 for social media presence,” says Suzie Blaszkiewicz, GetApp’s project manager of the rankings. To find out more, check out the top 25 accounting apps in full.